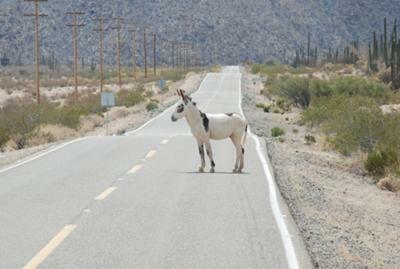 Donkey On The Road To Bahia De Los Angeles. What are our preparations prior to departure? Number 1, you must have a valid passport. Be sure to check the expiration date, you should not be traveling with a passport that will expire within 6 months. You must purchase Mexican Vehicle Insurance which can be purchased on line through many companies. We buy ours at a discount through the Discover Baja Travel Club and as a Baja Good Life Club member you can do the same, lots of options. This insurance must also be purchased for your towed if you have one. What should you consider purchasing before you go? As always, extra health insurance. Mexico has good medical at very reasonable rates, but you should consider your travel through the States. We purchase our medical insurance through BCAA at a reasonable rate, and they also have a great Baja map for free. MEDIPAC is also a great optional provider. A good Baja camping book is also a must! 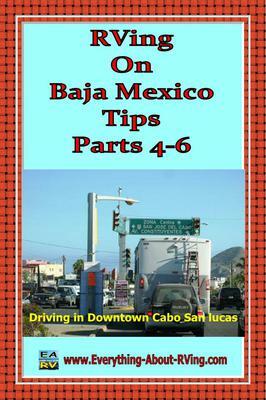 We recommend the Baja Camping by Mike & Teri Church . It is always good to have American dollars and Mexican pesos prior to entering Baja. We suggest purchasing some of each before you leave home. ATM’s for pesos are readily available throughout Baja and Credit Cards are usually accepted in larger centers. Where should we cross the border into Baja? There are 4 main crossings into Baja which include San Ysidro and Otay Mesa at Tijuana, Tecate and Mexicali. We usually cross just east of San Diego at Tecate and avoid the big city scene of TJ and Mexicali. There is no town on the US side, but you can park and walk across, get your tourist permit then go back and pick up your RV. There is also a nice San Diego County Park, Potrero, 10 minutes away with all the RV amenities. When you cross into Mexico this is a good time to get your Tourist Permit or Visa (FMM) which are obtained at the Immigration office. A small fee (approximately $25 per person) is then payable at the bank. You are then required to return to the Immigration office to complete the process. You will need 2 pieces of I.D. including your passport. We always get our pre-paid FMMs from the Discover Baja Travel Club which eliminates the bank visit and makes this experience one stop shopping. When you return with your RV to start your Baja adventure you will be required to stop and your RV will likely be inspected for items that may be taxed, having nothing to declare just drive on through and watch for signs to the Mex 2 or Highway 3 and signs to Ensenada. We always take our RV Caravans south on Mex 2 Toll and return on Highway 3.
exciting! In addition you may find very unique road signage, including stop signs. Signage can be placed in unexpected locations, such as: on the side of buildings, back from the corner, together with other signs, etc. A keen eye for these is always essential. In Ciudad Constitucion and La Paz the Police know where all the hidden signs are! Although the village has a large new entrance the town is virtually impassable for a large RV. A Truck & Camper or Class B can often find the streets very tight. RVers are advised to find a spot in the many campgrounds, beaches or RV parks and return with the towed or without the trailer. What should we know about highway driving? Much of Mex 1 can be narrow and without a shoulder, however for the most part this highway is very good and always undergoing improvement, with wider lanes and paved shoulders. As you drive, you will get used to it. Take your time, its part of the adventure. We recommend you travel 80 km per hour maximum. Hwy 19 between La Paz, Todos Santos and Cabo San Lucas is fantastic and should be almost completed this year. The ongoing upgrading construction efforts on Baja include new bridges where Vados (creekbed dips) and Arroyos (dry riverbeds) were once the norm. Although there is not a lot of traffic once you are a few hours south of the US border, it is the only highway. Truck traffic can be somewhat intimidating however the Mexican commercial drivers are very considerate with tourists and will let you pass safely whenever possible and vice-versa. The do’s and don’ts about passing and turning are vital to know. On the highway, when it is OK for passing, the vehicle in front of you will put on their left turn signal – this is giving you the all clear to pass. When a vehicle actually wants to make a left turn, 4-way flashers are used. Again, this is used for highway driving only. The key to driving safely on these narrow roads with big rigs is sharing the road and speed. Big rigs need extra room, particularly on the corners, just slow down, leave room and stay in your lane, use your common sense. The only time we have lost a mirror is when another RV (A Class Motorhome with California Plates) passed us on a corner! Other driving safety tips. Rain is not very common on Baja, however when it rains occasionally during the winter in the north, or September and early October (Hurricane season) in the south; the roads are often a mess! Again, common sense should always prevail. Be sure to take it slow, you never know what’s under all that water – rocks, mud, no pavement, etc. A local may take this opportunity to pass. Your next stop may be a car wash! Speed limits are in kilometres per hour, this is familiar for Canadians. Entering and leaving towns you will encounter “TOPES”. These are speed bumps. Take care, these can be very big! Often they are painted, often you are warned with signs. Often not ALWAYS! From time to time you may see people in the middle of the street collecting money for charities, slow down. We give them loose change – any amount will do, they are always thankful for any donations. 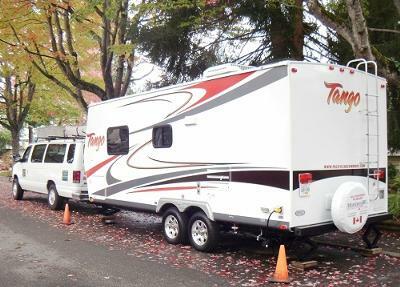 Click Here to tell us about your favorite RVing or Camping Destination.